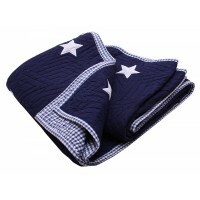 Traditional gingham fitted sheet in navy and white woven gingham. Made from 100% cotton and machine washable. Standard Delivery £5.95 per order up to 20kg for mainland UK only. For orders over 20kg and/or outside Mainland UK a delivery cost will be calculated separately. Orders will be delivered in 3-4 working days of the order being received.